TNY 2020 - 21st Excursion!! CHAM STORE IS OPEN -Tibetan and Uigher treasures for you.. 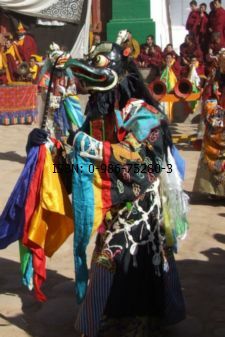 There are many dancers who perform a supporting role to the main characters of a Cham dance. They sometimes provide comic relief for the audience; other times they collect money for the monastery. In many cases they are representations of specific local gods and are not seen beyond the courtyard of the monastery where they are performing. In the case of two of them, they are constant companions of a Dharmapala. Nechung and other local protectors, along with supporting Atsara characters. Gonlung 2014. Gonlung Jampaling dancers (Shawa, Purok, Songdong, Mahakala accolytes) awaiting the arrival of the main Shanag dancers. Some of the common supporting dancers will first be introduced, followed by the Atsaras and others. All will be shown below in tabular format, more or less as they tend to appear. When proper names cannot be given, then generic forms are used. These skeleton figures are ‘worldly spirits’ and trace their history back to the Bon religion. 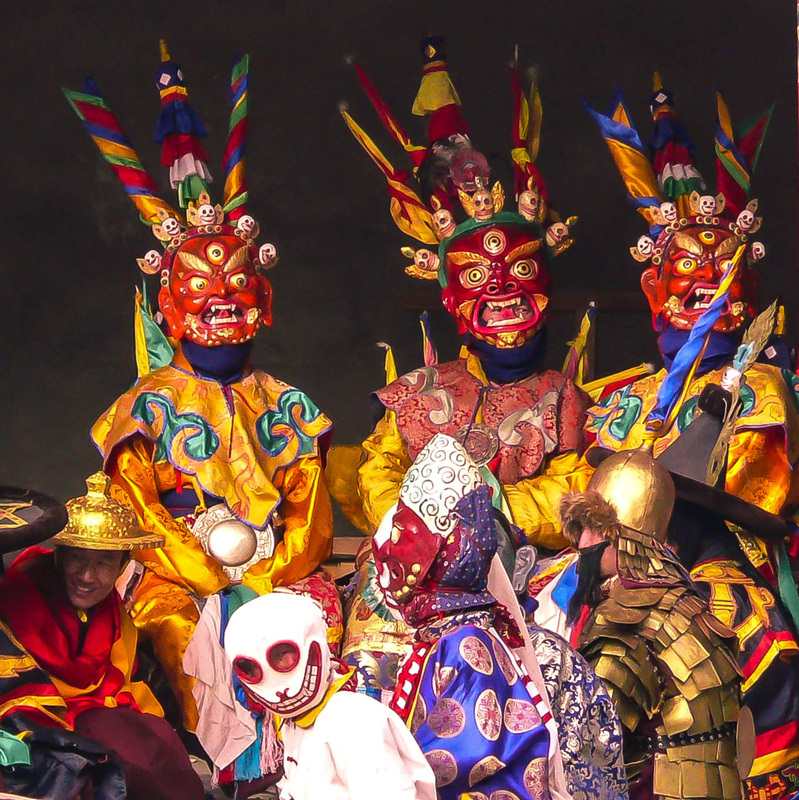 The Citipati were members of the original Vajrakilaya Cham dance initiated by Padmasambhava at the Samye Monastery in the 8th century. Known as ‘Skeleton Dancers’. Note the long fingernails (and also toenails). They are protectors of the charnel grounds. Today the Citipati are helpers in the conduct of many Cham dances, not just those of the Shanags. Not to be confused with Shmashana Adhipati who are ‘wisdom protectors’ and emanations of Chakrasamvara. Part of the larger group called Atsaras. The Gangre are helpers, who usually dance as a pair or a group of four. They are sometimes confused with the Citipati, but the colourful costume of the Gangre, and the single skull diadem, are significant discriminators. Gangre are mid-level skeleton dancers, having graduated from ‘ging’ but not yet ready to become ‘Citipati’. This acolyte of Palden Lhamo follows behind her master. Red-brown in color iconographically, she has the head of a Snow Lion. Songdong normally carries a chopper in her right hand and a skullcup in her left, although during the Cham dance she will carry the same implements that others carry. Another one of the assistants to Palden Lhamo, this crocodile‐type acolyte leads the goddess wherever she goes. She guides Palden Lhamo’s kyang (mule or horse) with a long bridle, sometimes in the form of a long snake or Naga. 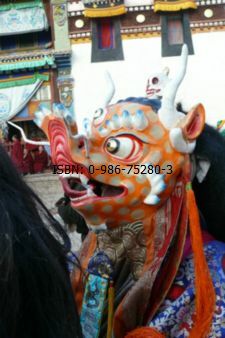 One of the more elaborate and mystifying masks to be seen in the Cham dance. The Stag-headed dancer is a messenger of Yama. In another instance, the Stag dancer uses his antlers to symbolically dismember and shred the lingka and then scatter the pieces with the antlers. Normally the Stag carries a sword, but this can be replaced by the thod khrom (mummified corpse) instead. Some monasteries perform the Dance of the Stag (also called the Milarepa Cham) which celebrates the conversion of hunter Gonpo Dorje to Buddhism by the mystic Jetsun Milarepa. A character from a famous story about the powers of the mystic Jetsun Milarepa. Meditating in the woods, an exhausted deer encountered Milarepa. The mystic spoke with the deer and told him not to worry about being hunted. Then the dog appeared, and Milarepa also calmed him and convinced him that killing was harmful; he lay down next to the deer. Then the hunter appeared and Milarepa showed him the error of his ways - he became a believer that all being should be protected and saved. A strong example of the power of Tibetan Buddhism. Raven-headed, Purok is one of the main messengers of Mahakala. He is senior to, and always dances in front of, Chisun and Songdong. Purok is a dancer and does not undertake crowd control or other functions. 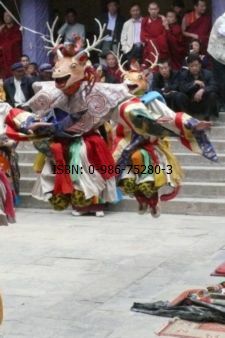 Young monk dancers in a basic costume and skull mask - no skull diadem and no ear decorations, no adornments of any kind. Can be considered the entry-level of skeleton dancers. Ging perform ‘jobs of work’ and other basic tasks. They are also used as semi-comical characters, such as shown in this photo where they are about to cajole money from the Dorje Lopon at Shachong Gompa. Known in some areas as Kashin Khan. Some say he was a Chinese monk who lost a critical debate with a Tibetan monk about which of their schools of thought (Chinese or Tibetan) was correct. Sometimes he is seen as an arhat and treated with great respect; other times he is treated with humorous ridicule and scorn. He may have two to six family members in attendance to help him. His appearance always provides a relaxing break for the dancers from the intensity of the Cham dance. During these 'intermissions', Ha Zhang's family help collect donations for the monastery - or for themselves! Ha Zhang family members collecting money from the crowd. Two muslim-faced Atsaras who control the crowd and keep order. Acrobatic Atsara - twists, twirls and throws pole which must NEVER touch the ground. A central dancer in the Milarepa Cham. Shown with Showa the deer. Muslim character Atsara. Characteristic 'big' nose and short beard. Colourful turban wraps his hair. 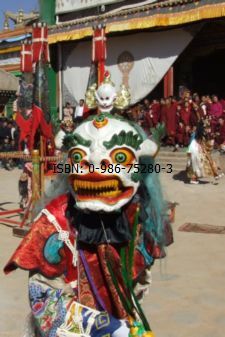 Uigher character dancing in Atsara role at Kumbum Monastery. Mongolian warrior dancer at Gonlung Jampaling. Citipati feet and toenails. Kumbum June 2010. Muslim Atsara and the universal greeting!! THE MORE TERRIFYING ... THE MORE WRATHFUL ... THE MORE EFFECTIVE ! !